The correct garb for a pro-Prolocutor of the Convocation of Canterbury. As a Bishop’s Chaplain, I do ‘big church’ fairly often. It’s not that I don’t like it, but I can’t take too much of large-scale liturgy, grand choirs and all that goes with it. 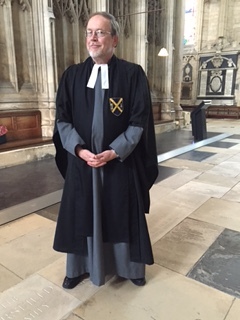 However, my role as a minor Officer of the Synod requires me to attend the Synod Sunday morning service in York Minster, robed in traditional Convocation garb – and I quite enjoy it. beautifully-executed liturgy with a magnificent choir. 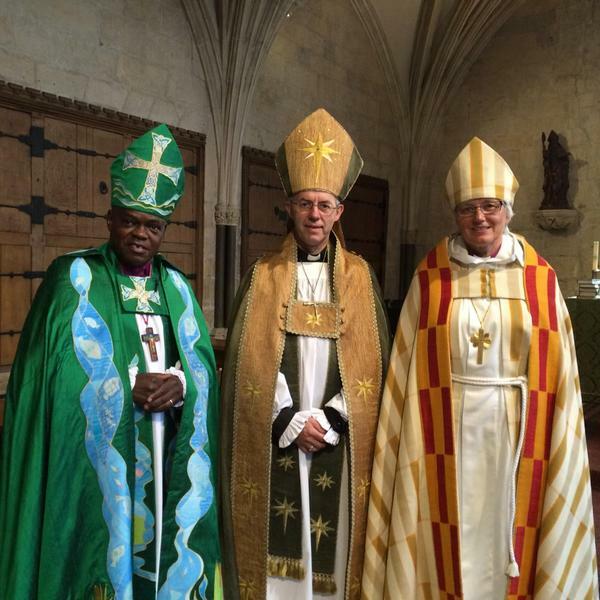 Archbishops Sentamu, Welby and Jackelen after the service. Sadly you can’t see the lappets – they are the bits that hang down the back of their mitres. Archbishop Jackelen’s presence was significant. In the Southern Province of Canterbury we are not yet used to women Bishops (give it a few weeks and that will change), but in York they have two of their own already (Libby Lane and Alison White). So it was rather good to have Dr Jackelen with us, and it felt quite normal. Clerical style experts would be interested to know that the lappets on her mitre were very long, so much so that they seemed bigger than the hat part. On a personal note, while robing I was reminded that the academic gown I have to wear was actually my late father’s. He had it for his graduation in 1938 (that is not a misprint). Telling a colleague about this I was suddenly brought up short with the thought that he would almost certainly have visited York Minster as a child, being brought up in the nearby North York Moors. It felt rather odd (in a good way) to be wearing his gown, and my colleague insisted on taking a picture that I can share with my brother and sister when I see them next week. And (above) with you. I travelled in on the bus with Charlotte, a Rural Dean from Coventry, who is another clerical Synod blogger. I suspect she’ll post something about this Synod when she gets home – check here. Yes, Synod does achieve things! Business-wise, it was a great Synod day, as we signed off three things that gladdened my heart. The new simpler alternative Baptism rite (read it here). Urban clergy asked for this more than five years ago. There is still a bit of discomfort amongst some that the new text is ‘baptism lite’, but people overwhelmingly feel it gives clergy an option in situations where the Common Worship text is just too long and heavy. It will be legal from September! A complete coherent set of Standing Orders, all shiny and ready for the newly-0elected Synod to work with when they meet in November. Not that new members will make any sense of them – it took me some years to really comprehend the very complex rules that govern proceedings. Still, they have got shot of all the Latin lawyer-speak, so at least they are in ‘a language understand of the peoples’ (which is rather important to Anglicans). I’m not going to post a link. They are 91 pages long and you have much better things to do! New regulations about who may assist the clergy in administering Holy Communion. (read them here). Recidivist readers of the blog will know I have been pursuing this in Synod for some years. The new regs come into effect in October. They mean that in some circumstances children will be able to administer the bread and wine. And (more significant to me), the Bishop can devolve authorising people to undertake this ministry to incumbents, Archdeacons or Rural Deans. I spoke yesterday, asking that something be put in place setting out what paperwork and records of who has been authorised are put in place to replace the current certificate issued by Bishops Offices, and it seems this will happen. Result! I’m disproportionately pleased that something I have pushed for has actually happened. I rushed back to the hall for evening worship at 6.20 p.m. because it was going to be a Synod ‘first’. 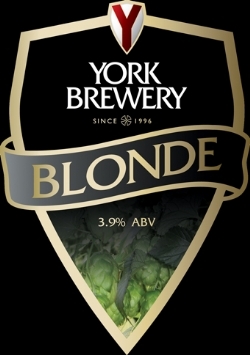 Instead of the moderately traditional approach of a simple evening Office, or the hitherto immovable visit of the York Minster choirmen singing Evening Prayer from the BCP, were had a worship group from the church of St Michael le-Belfrey in York. What a contrast to the Minster ‘big church’ service this morning! It was high-octane, and high-risk – Synod doesn’t usually do worship in ‘New Wine’ mode, despite the fact than many members come from churches where guitar and keyboard based bands are the norm. I bet some found it very odd indeed, but large numbers were obviously caught up in the atmosphere created by a very versatile and sensitive group with keyboard, flute, cello and guitar. But it paid off, and I am sure they will try to repeat it another time. Mealtimes equal fringe meetings at York. Tonight I went to a gathering organised by my old training college, St John’s Nottingham. Apparently abut 10% of clergy on Synod trained there, but not quite as long ago as me. The new Principal, David Hilborn, talked to us about the controversial decision to stop residential training there, and move towards a different kind of institution that supports non-residential and parish-based training so successfully seen in regional courses like STETS and St Mellitus. The changing face of ministerial training has dictated the decision, but having spent four years (this is not a misprint) training at St Johns from 1973-77, I couldn’t help but feel something significant has been lost. The Archbishops’ Council budget is a huge responsibility for Synod. After dinner we were told that the budgeting model is bust, and new sustainable ways of financing the central services of the church are needed. After a question time, when John Spence had his feet held to the fire as members asked questions about the IT budget, safeguarding costs and other one-off issues, the Bishop of Birmingham (in the chair) orchestrated the authorisation of £32 million pounds in about seven different budget headings in about one minute and a half. Is it goodbye? Or au revoir? And tomorrow it ends. We are to spend the whole day on climate-change related issues, and conclude with a Communion service before we all rush to the station to get home before we turn into post-Synodical pumpkins. I’ll try to post a report, but can’t guarantee when it will appear. This entry was posted in 2015: July - York, General Synod and tagged Church of England, General Synod, York Minster. Bookmark the permalink.